Be sure to check the blog from time to time! Sometimes I post stuff like this. This is my third strip about “Good Time.” What the crud, self. The joke is that James does not practice good firearms safety! Oh hey, I have a guest strip up at Multiplex today! You should go read it. Now I’m just ripping off Shortpacked. Allow me to introduce Reginald, the Holiday Motor. I created him (and this comic) to promote this year’s holiday specials at my place of employment, National Liftgate Parts. 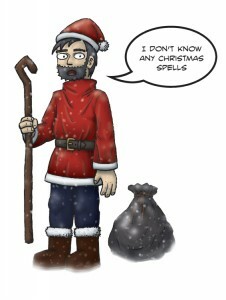 This comic was first published in the December 2012 issue of our monthly specials, but you don’t have to be an NLP distributor to enjoy Reginald and his festively non-denominational shenanigans. Easy on the eggnog, folks, and happy holidays. So yes, Jimmy-Jimmy, there have been shirts featuring the Howard, but don’t let that from stopping you from purchasing your own. A tenuous explanation if ever I saw one. And now, prepare yourself for my relentless holiday shill! Blah blah blah, Santa Howard shirts, limited-time holiday offer, blah blah. And now it’s time for me to get started on this week’s comic #2. We can no longer guarantee holiday delivery for Santa Howard shirts, but they’ll still be available through December 25th. Get one now and give it to a friend for the Fourth of July! We’ve also got some other sweet holiday deals in the Sketch Comedy Store, so swing by and have a look around.